All this, and a photo of a pregnant fighter pilot, lit the spark for the incredibly powerful one-and-a-half-hour monologue that is Grounded. Director Dom Mercer describes the play as “urgent and immediate”. 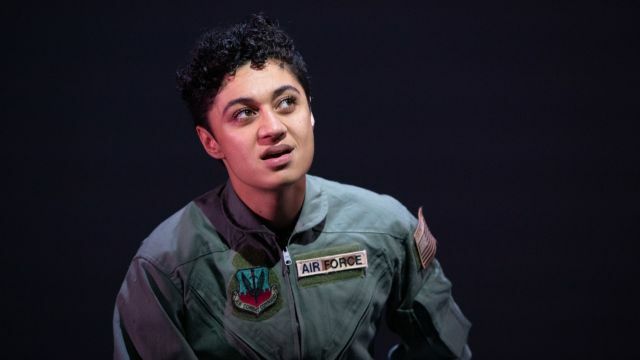 It has had over 100 productions world-wide since 2013, and Mercer’s production, with Emily Havea firmly in the pilot’s seat, is one that few will forget. Dressed in a grey flying suit, she performs on a brown tiled stage, empty but for a chair and a helmet. Stretched high behind her is a curved cyclorama that symbolises the sky, the ‘blue’ that is her prized horizon, the job that she has earned through ‘sweat, and brains and guts”. You are alone in the vastness and you are the blue. Things change when she meets Eric and falls pregnant, but they both take that on board, knowing that she can return to the air force after the birth. And she does, only it’s not to her beloved ‘Tiger’ but to the “chair force” as a drone operator, confined in a caravan in the desert, sitting for hours, day after day, watching grey pictures through the multiple eyes of the drone thousands of miles away. Watching, waiting to strike; striking, then watching again as the smoke settles, the bodies stop moving, and they too, gradually, become part of the ‘grey’. Worst of all, it’s a day job. There are no barracks where fellow pilots live and meet at the end of a run. At the end of shift she drives through the desert back to the normality of home and family and the gradual realisation of what she is doing. Even the music of AC/DC that was once her ‘decompression’ on the way home eventually fails her. Havea meets the challenge of this absorbing script in a performance that is rich and hungry, powerfully real and grippingly convincing. The writing is compellingly authentic. Short bursts of words and unfinished phrases are perceptively descriptive, intuitively personal. Havea delivers them with discerning pauses, tight control, wry humour, subtle gestures, perfect timing. This is a formidable performance that in Mercer’s words “may haunt” audiences for some time. Designers Jonathan Hindmarsh (set and costume), Alexander Berlage (lighting) and Mary Rapp (sound) have worked closely with Mercer to achieve the different vibes and moods of this extraordinary play. Subtle changes of colour on the cyclorama take it to the desert of Nevada and then to the grey ‘prison’ of the stifling caravan where the pilot sits for hours operating the drone. “Strikes’ are signified by flashes of light between the tiles on the floor. Drum beats cite a change in mood, place and pace. Each facet of the design is inherently linked to the intricate direction and skilful performance of this complex, cogent story. 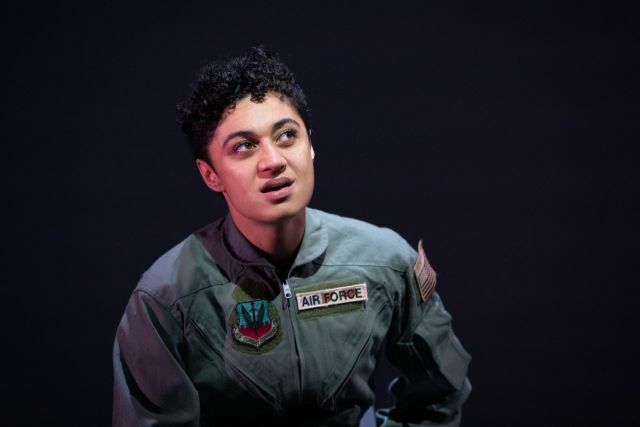 It is a coup for Riverside, the National Theatre of Parramatta, Dom Mercer and his creative team – and especially for Emily Havea.